1. In a small saucepan, combine 1 cup of blood orange juice and sugar. Warm over medium heat until the sugar has completely dissolved. Remove from heat. 2. Add the rest of the blood orange juice, white wine, and orange zest. Cover and chill thoroughly in the refrigerator. 3. Once chilled, freeze the sorbet base in your ice cream maker of choice. (Here's mine , which works like a dream, and I also have this one .) 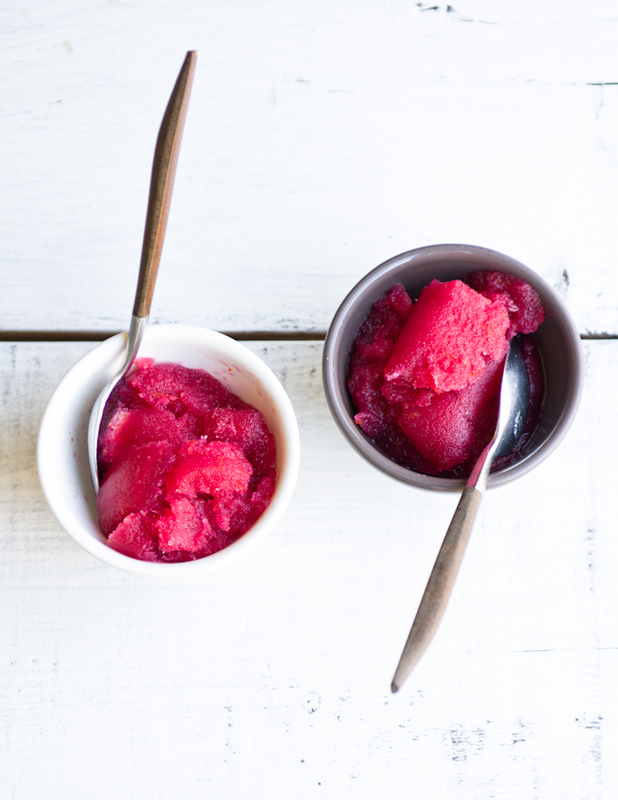 Once churned, you may want to let the sorbet harden further overnight in the freezer. 1. 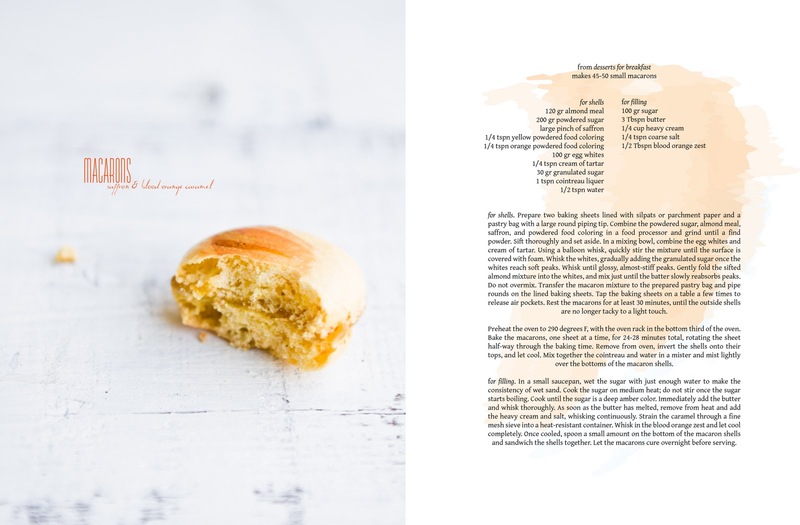 Prepare two baking sheets lined with silpats or parchment paper and a pastry bag with a large round piping tip. 2. Combine the powdered sugar, almond meal, saffron, and powdered food coloring, if using, in a food processor and grind until a fine powder. Sift thoroughly through a fine mesh strainer and set aside. 3. In a separate mixing bowl, combine the egg whites and the cream of tartar. Using a balloon whisk, quickly stir the mixture until the entire surface is covered with foam. Then, start whisking the egg whites, gradually adding in the granulated sugar once the egg whites have reached soft peaks. Whisk until you reach glossy, almost-stiff peaks. 4. 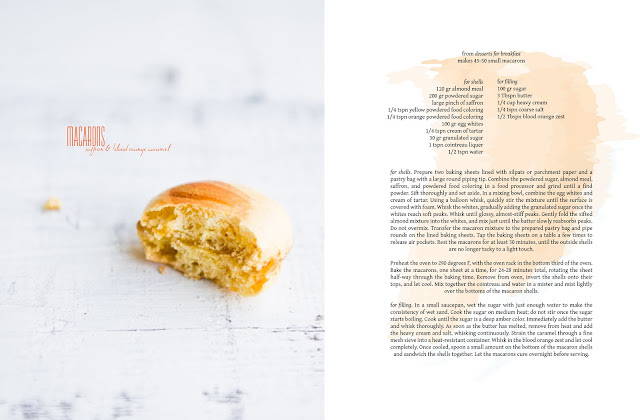 Gently fold the sifted almond and powdered sugar mixture into the egg whites in two to three stages. Mix just until the ingredients are incorporated and the batter slowly re-absorbs peaks. Do not overmix! 5. Transfer the macaron mixture to the prepared piping bag and pipe rounds on the lined baking sheets. Tap the baking sheets on the table a few times to release air pockets. 6. 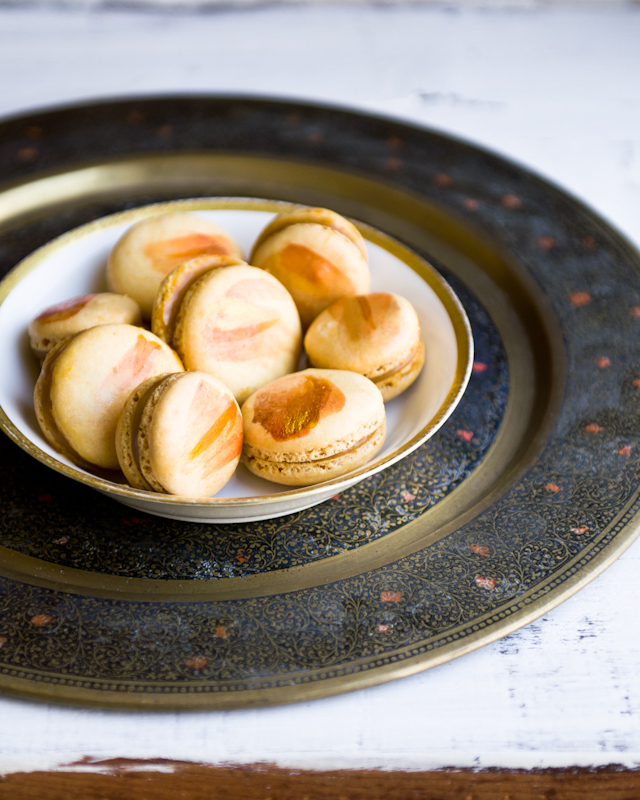 Rest the macarons for at least 30 minutes (and up to 60), until the outside shells are no longer tacky and sticky to a light touch. 7. Preheat oven to 290 degrees F, with the oven rack in the bottom third of the oven. 8. Bake the macarons in the oven, one sheet at a time, for 24-28 minutes total, rotating the sheet half-way through the baking time to insure even baking. 9. Remove from oven, invert the shells onto their tops, and let cool. 10. Mix together the cointreau and water in a mister. Mist lightly over the bottoms of the macaron shells. *Note: the resting and oven temperature and times are adjusted to what works in my kitchen and oven (which, to my knowledge and according to two oven thermometers, is quite accurate). Please note that you may have to adjust according to what works in your kitchen and oven. 2. In a small, light-colored saucepan (with tall sides, preferably), wet the sugar with just enough water to make the consistency of wet sand. 3. Cook the sugar on medium heat. Do not stir once the sugar starts boiling; swirl the pan around gently instead to insure even cooking. Cook until the sugar is a deep amber color. Immediately add the butter and whisk thoroughly. 4. As soon as the butter has completely melted, remove from heat and add the heavy cream and salt, whisking continuously. 5. Once the cream has incorporated, pour the caramel into another heat-resistant container to cool, straining through a fine mesh sieve to remove unevenly cooked sugar, if necessary. Let cool briefly and whisk in the blood orange zest. Caramel will continue to thicken as it cools. 6. Once completely cooled, spoon a small amount on the bottom of the macaron shells and sandwich the shells together. Let the macarons cure overnight before serving. These sound awesome!! Love it! 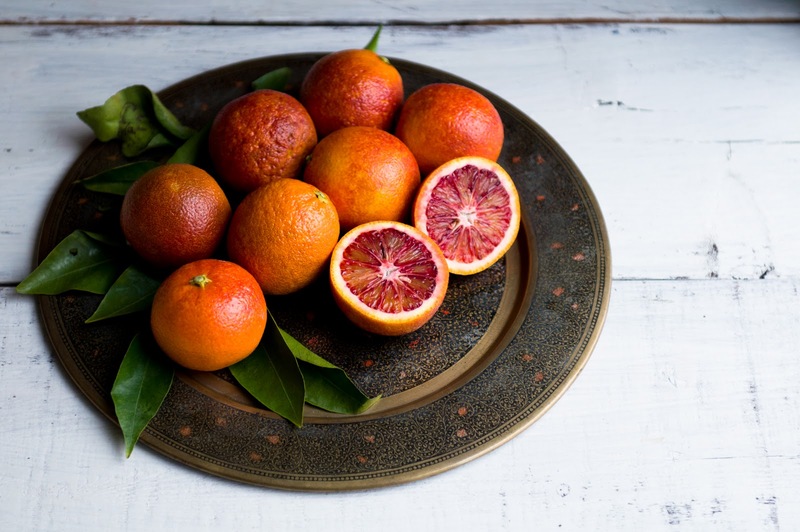 absolutely beautiful...and the last shot of the blood orange is SO stunning...you should make a print of it! I've been wanting to make something with blood oranges for the last few weeks - for some reason I can't find them anywhere! Your sorbet looks completely gorgeous, definitely bookmarking to try once I get my hands on some. This is beyond gorgeous! Enjoy your trip. 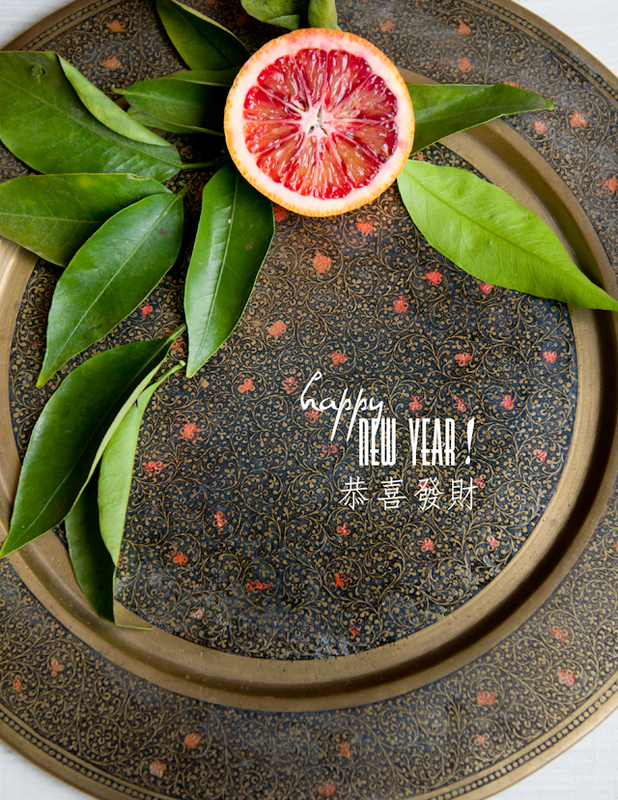 Happy New Year, and glad your camera is ok.
What a delicate and delicious looking desert. 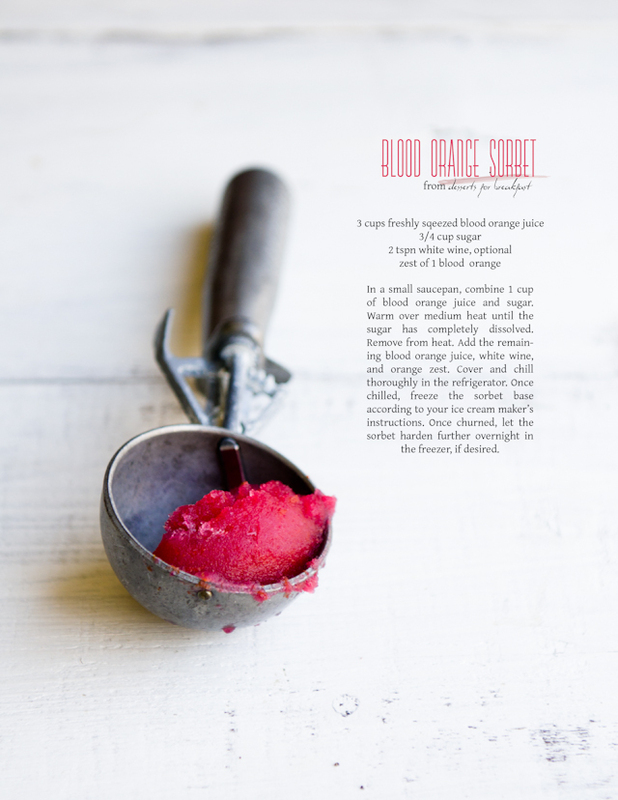 I love sorbet and great idea with the blood oranges. Lovely! 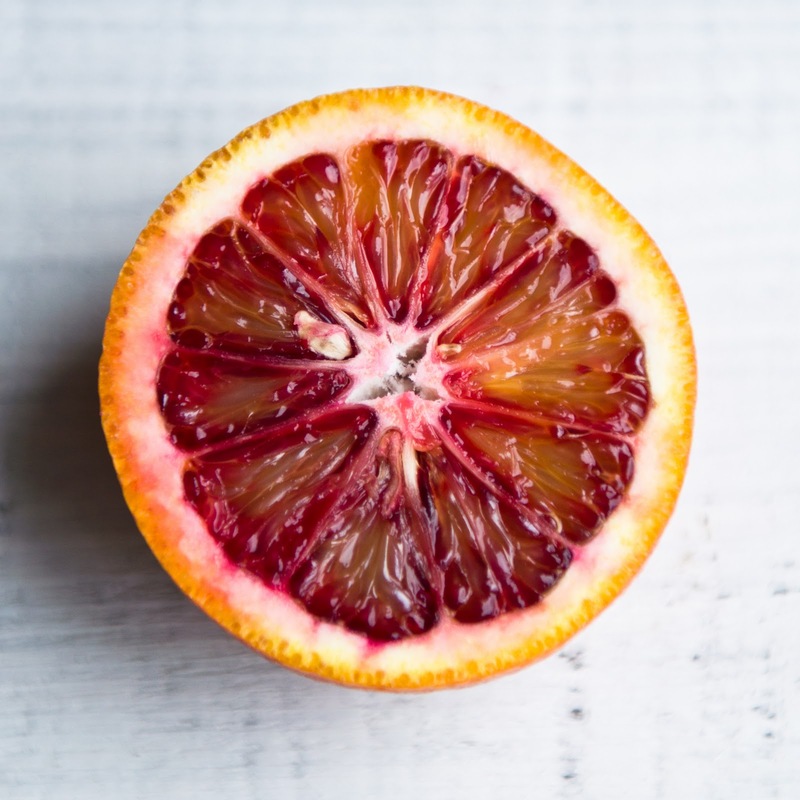 I've been seeing so many enticing recipes for blood oranges, but I can't seem to find those oranges around here. Boo. I'll have to enjoy vicariously through these pictures for now. Beautiful! 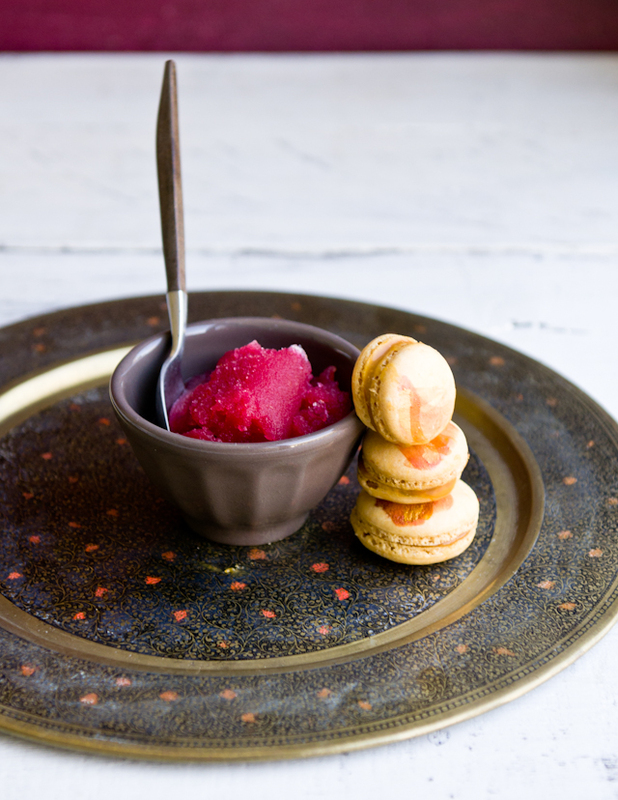 The macarons and blood orange sorbet! Really something. Enjoy your trip!! Sounds fabulous.